For decades, space experts have been trying to find answers to one mystery that remains unsolved – is there extraterrestrial life? Countless numbers of photographs and videos have been shared on the internet of possible UFO sightings, but are either just camera glitches or have been Photoshopped. However, one woman in Dubai is convinced that she experienced an out of this world experience on Saturday when she was in a car on Al Khail Road. 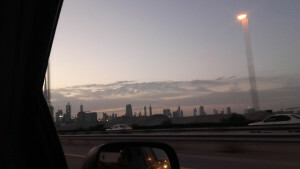 Dulanka Bandara captured what she thinks is an unidentified flying object (UFO) on camera near the Burj Khalifa. The 34-year-old Sri Lankan housewife says the beam of light she photographed could be “aliens looking to study the human race”. Bandara added: “I’m sure it’s a UFO. If you look at the shape of the object and the beam that’s shooting down, you can tell it’s a spaceship. They probably have visited us before many times but they have the ability to be visible or become invisible when they wish. Even though Bandara feels certain she has spotted what NASA has been trying to find proof of for decades, an expert at the Dubai Astronomy Group has dismissed the claims as just a trick of the light. 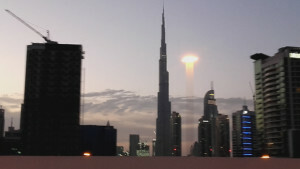 Hasan Ahmad Al Hariri, CEO of the Dubai Astronomy Group, said that a lighting glitch probably occurred because of a lamppost and the speed of the car as the picture was taken. Al Hariri said the group receives at least four enquiries about possible UFO sightings around the UAE every year. He said they do take all of the enquiries “seriously” and investigate the pictures sent to them thoroughly for an explanation. “Yearly, we get four or five enquiries about UFOs,” he said. “The approach we take is that first we gather all of the information and then we make a deep analysis of the photo and there is always a camera glitch that explains why the ‘object’ is there.